1) I have THE BEST customers on the planet. Their loyalty constantly brightened my day. Even when they didn't make a purchase, I was showered with smiles and laughs from people who are now old friends (and some new ones too! )Many stop by with their kids who I just love to watch grow up, and some seem to stay forever young as well:) This show does not have the rude, uncouthness of some other shows I do. I truly enjoyed every encounter. 2) The booth numbers were screwy. Mine was 57, next to me was 68, and 58 was a dozen booths down on the other side of the street. 3) There are maybe 100 vendors, but somehow, me, another soapmaker, and the potpourri guy, all were in the same 50 feet. This means our scents conflict and we can't take advantage of one of our strengths- our fragrance and people smelling it as they walk by and being enticed in the booth. 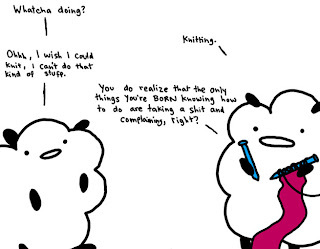 I had a doctor of mine the other day relate to me how she tried to learn how to knit when she was pregnant and just couldn't do it. I mean, she is a doctor, she completed medical school, and she can't learn to knit??? Everyone learns different, she tried by a book. But if you are trying to learn and are having trouble try a book, try a class, try videos on Youtube, or try a combination of them all. And if you don't like your class or instructor, try another! Sometimes the way people teach just doesn't work and we just need to try another way. But yesterday the crafters were scarce. I figure that between the rain delay, and the not wonderful weather yesterday, may crafters decided to stay home or do another show. So the spaces that were empty were filled by the local stores with their merchandise (nice stores by the way..) so the street wasn't as much of a crfat fair as a street fair kind of atmosphere. But even with the questionable economy, and the rain delay, I still did pretty well. I sold two shaving mugs which is exciting and they got a lot of attention as well. I also got a lead on a possible new show which is great news too. So someplace was giving out balloons to the kids. I kept seeing these white balloons go by with what I thought were the shapes of continents on them. So I turn to K an say "I think those earth balloons are cool, but they would look better if they were blue rather than white"..to which she replies.. "That is because they are cows"...after a better look, there were no distinguishable continent shapes at all.. I got a new exercise program for the Wii yesterday. C got it for me as a birthday present. It is quite a work out. I did 30 minutes at intermediate level and burned off 190 calories. 8) using the balance board makes it harder, I think. This past weekend was the Mother's Day Craft show in Bethlehem. It was up on Main Street. Hands down this show and I have a love/hate relationship. I love the sales and hate the weather. Saturday the show is typically slower and my sales were off by about half from previous years. I knew that this economy crunch was going to effect us crafter but I think that this kind of show in particular may be the hardest hit. Most of the people there are two dimensional artists (think $1200 paintings), photographers, and jewelers. There are potters and a few other fine crafters like myself, but it is much more an art show than anything else. I think that some people don't want to be reminded of their financial problems by "window shopping" high end fine arts and crafts. Saturday night the wind came. We survived it, but many, many others didn't. There was rampant wind damage with some people loosing their expensive ($1000) tents, not to mention their work. I counted at least a dozen with major damage. Some even had to come in the middle of the night to get their things that were strewn all over the street. When we got there we just packed and left. To me there is nothing worse than loosing the tent and displays to weather when you can make an informed decision and avoid it. Sometimes storms sneak up, but when you know what you are going to be against, sometimes it isn't right to fight it. I hope that the people who stayed did really well and made lots of money. So I apologize to anyone who braved the wind on Sunday to come find me, only to find an empty space. I just couldn't do it. I couldn't risk having to buy another tent, and I couldn't risk my safety and the safety of the customers. Wind is dangerous. I'll take rain over wind any day. What do I knit in a month? Now, I did have a lot of down time: C traveled leaving me home alone at night, I went on vacation and could knit in the car, and then I took a week off to mourn Pimienta. But still, that is quite a bit! It is another rain filled day, it is just not going to stop. Saturday is dreary, Sunday was wet, yesterday all it did was rain, and today it continues. It may dry out (but be cloudy) tomorrow) and then rain again on Thursday. I guess I shouldn't complain, rain during the week is better than rain on the weekend of a show. Besides, after a week of rain everyone will want to get out of their house and do something and hopefully that means coming to a craft show. The rain means all I want to do is sit and nap, or sit and knit, with some large sweater or afghan on my lap. I started a new sweater the other day. There has been this patter that was just nagging at me to knit it. Usually it is the yarn that speaks to me- like the skein of camel that I just HAD to do SOMETHING with (it became a neck warmer), but this time it was the pattern. It is a simple pattern, with minimal seaming, and I KNEW i had the PERFECT yarn in my stash for it. So I bought it and started. One thing about me is that I knit oddly. I rarely can get gauge. Typically I have to go down 2 needle sizes to get stitch gauge, and that messes me up on row gauge. So I tried going down to 13's and was waaay off, and then up to 17's and that didn't help. I ended up going out an buying the recommended needles (15's) and then altering the pattern from there. Luckily, it comes with a schematic that tells you what the dimensions should be, so after getting close to stitch gauge, I am just kitting to the dimensions rather than bothering with the number of rows it calls for. It was funny, C asked me if this is always what my knitting is like- I told him it is if I am actually knitting something where I care about the fit or size, but typically I just go for it. I figure if I can't wear it someone else can and it will always find a home. But with the expensive yarn, then I fiddle till it will fit right. I am not spending a ton of money on yarn to be forced to rip it our or give it away. I just got done sniffing out one such scam. It started as a question if I accept international orders. I do, so I responded as such. The second e-mail asked me for a quote for a large amount of product, plus shipping to an overseas (Australian address). This e-mail mentioned that they were buying this product for resale. I sent the quote for wholesale, my wholesale requirements (as stated on my web site) and a quote for international overnight shipping of 200 lbs of product. The response stated that in fact it was not wholesale, but for a company party, and that they have a shipping company here in the US that could come pick up the merchandise. This is where it starts smelling funny to me and I start to think that something is seriously amiss. I revise the quote- retail price- explain that I am happy to ship to their US warehouse for free, but that we do not allow for merchandise pick up at our location. I even offer a 10% bulk discount. I also explain that I need 50% to begin manufacture of their large order, and I send them an invoice via PayPal so they can send payment easily. The last email is in very broken English telling me that I can ship to a location in the US, but this shipper only accept payment (for shipping overseas) from the SELLER... That they will overpay me and then I need to Western Union the overpayment to the shipping company. Now I know that something is wrong and I return an e-mail regretfully telling them that this practice is against our company policy and that we cannot comply with their request. So it has taken me 6 emails (at least) and a week to determine that this order is in fact a scam. Not only is is depressing that I will not be making thousands of dollars on this order, but it has wasted my valuable time that I could have used in a much more productive manner. I wonder how many people this works on. I feel sorry for them. It was easy to be caught up in the large order, to be excited. I told a few friends about it because I thought it was cool. But getting too caught up in it could have cost me thousands of dollars in supplies and lost funds. I guess the saying is true- if it sounds too good to be true, it probably is.